The Battles of Khalkhyn Gol were the decisive engagements of the undeclared Soviet–Japanese border conflicts fought among the Soviet Union, Mongolia, Japan and Manchukuo in 1939. The conflict was named after the river Khalkhyn Gol, which passes through the battlefield. 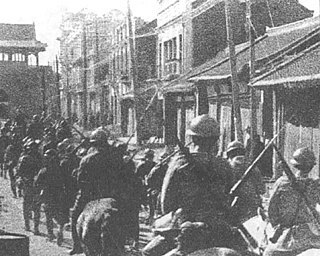 In Japan, the decisive battle of the conflict is known as the Nomonhan Incident after Nomonhan, a nearby village on the border between Mongolia and Manchuria. The battles resulted in the defeat of the Japanese Sixth Army. The Manchukuo Imperial Army was the ground force of the military of the Empire of Manchukuo, a puppet state established by Imperial Japan in Manchuria, a region of northeastern China. The force was primarily used for fighting against Communist and Nationalist guerrillas in Manchukuo but also took part in battle against the Soviet Red Army on several occasions. It initially consisted of former National Revolutionary Army troops of the "Young Marshal" Zhang Xueliang who were recruited after the Japanese invasion of Manchuria en masse, but eventually expanded to include new volunteers and conscripts. The Imperial Army increased in size from about 111,000 troops in 1933 to an estimated strength of between 170,000–220,000 soldiers at its peak in 1945, being composed of Han Chinese, Manchus, Mongols, Koreans, Japanese, and White Russians. Throughout its existence the majority of its troops were considered to be mostly unreliable by their Japanese officers and advisers, due to poor training, equipment, and morale. Jun Ushiroku was a general in the Imperial Japanese Army. Alexey Nikolayevich Krutikov was a Soviet military leader. Hokushin-ron was a pre-World War II political doctrine of the Empire of Japan which stated that Manchuria and Siberia were Japan's sphere of interest and that the potential value to Japan for economic and territorial expansion in those areas was greater than elsewhere. Its supporters were sometimes called the Strike North Group. It enjoyed wide support within the Imperial Japanese Army during the interwar period, but was abandoned in 1939 after military defeat on the Mongolian front at the Battles of Khalkhin Gol and the signing of Soviet–Japanese Neutrality Pact. It was superseded by the diametrically-opposite rival policy, Nanshin-ron , which regarded Southeast Asia and the Pacific Islands as Japan's political and economic sphere of influence and aimed to acquire the resources of European colonies while neutralising the threat of Western military forces in the Pacific. The Battle of Mutanchiang was a large-scale military engagement fought between the forces of the Union of Soviet Socialist Republics and the Empire of Japan from August 12 to 16, 1945, as part of the Soviet invasion of Manchuria in World War II. Due to the short nature of that campaign, this was one of the only set-piece battles that transpired before its conclusion. 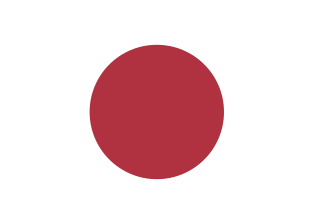 During the battle, elements of the Japanese Fifth Army attempted to delay the Soviet Fifth Army and First Red Banner Army long enough to allow the bulk of the Japanese forces to retreat to more defensible positions. Though casualties on both sides were heavy, the Red Army forces were able to break through the hastily organized Japanese defenses and capture the city ten days ahead of schedule. Nevertheless, the Japanese defenders at Mutanchiang achieved their goal of allowing the main forces to escape. KANTOKUEN was an operational plan created by the General Staff of the Imperial Japanese Army for an invasion and occupation of the far eastern region of the Soviet Union, capitalizing on the outbreak of the Soviet-German War in June 1941. Involving seven Japanese armies as well as a major portion of the empire's naval and air forces, it would have been the largest single combined arms operation in Japanese history, and one of the largest of all time.